Almost all types of tiles, such as ceramic wall and floor tiles, terrazzo, quarry/sand stones and marbles can be affixed using UNIFIX 401 Tile Fix. UNIFIX 401 in a ratio of 5 to 6 litres of water per 20 kg bag. Mix to a uniform lump-free consistency. Leave for approximately 5 minutes to allow the resins to completely dissolve. Moisten the support if necessary, but never the tiles. Mixing should be by a forced action mixer. Hand mixing is recommended for small quantities only. 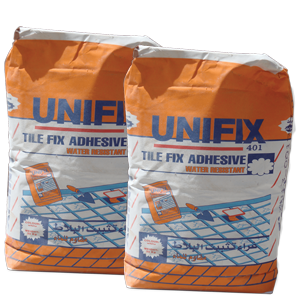 Apply UNIFIX 401 to a uniform thickness of 3 mm to 6 mm on the support to cover the slots on the back of the tiles on an area of not more than 1m2 at a time. For horizontal applications a solid bed fix is recommended as well as for heavy duty vertical applications. For other vertical applications use a toothed spatula to comb horizontally to remove excess. The trowel should have 6 mm notches at 25 mm intervals centre to centre. Apply the tile press it, smooth out carefully so that the mortar is spread evenly. If the bonding is perfect, the tile will not slide. The joints can be filled with UNIFIX 401 (Available in grey, white or matching colors on request. The open time of UNIFIX 401 at 300 C approximately 40 minutes. Therefore care should be taken in preparing the mortar. Prepare only the surface which can bi tiled within this time. UNIFIX 401 should not used on painted or metal surfaces. UNIFIX 401 can be kept for 12 months in unopened packs. Unigrout 201 is applied internally and externally and where heavy traffic is present. Unigrout 201 is ideal for bathrooms, shower rooms, kitchens, in private and public buildings and in swimming pools. 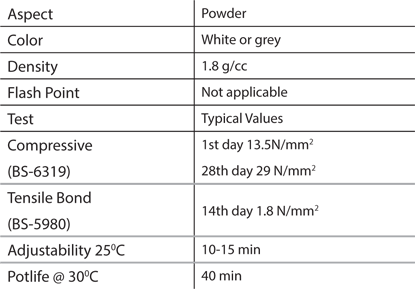 Unigrout 201 is a premix of finely selected raw materials, comprising clean, very fine silica sand, portland cement, and selected additives to enhance workability and application characteristics. 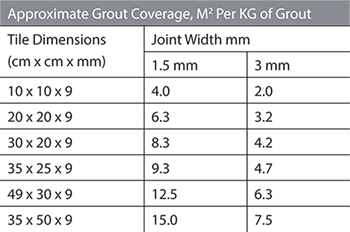 Unigrout 201 is available in a variety of attractive colors. Colors are formulated with high quality inorganic pigments providing high chemical and UV stability. Smooth texture. For indoor and outdoor use. Non - cracking. Easy to apply. Easy to clean. Rapid hardening.